"Empowered, ""Empower Yourself"" Sterling Silver Ring"
You are a strong. You are smart. You are valued. These women's empowering rings are a great reminder for any woman/girl to tap into that which makes her so strong and special. EMPOWER OTHERS. 10% of all proceeds will be donated to organizations focused on empowering women. 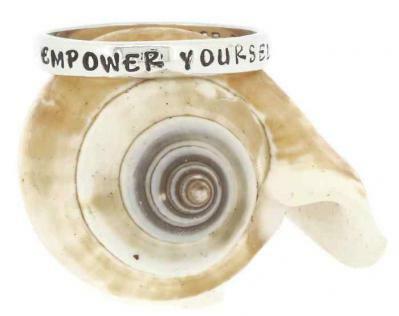 Our stamped Empower Yourself ring is a simple reminder to take what you deserve. This listing is for the single ring. Dimensions: The sterling silver bands are approx 3mm wide. Sizing: When determining your size, we ask that you give us a size that is a snug but comfortable fit. If you are unsure of your size, you can order a ring and select the option for ring sizer from the dropdown and we will send you a ring sizer and instructions on how to send us your size. If you plan on stacking mulitple rings you should consider ordering a half to whole size larger depending on how many rings you will be stacking. If you are unsure of your size you can order a ring sizer from the dropdown and we will send you a ring sizer in the mail and instructions on emailing us your size. This gift can wrapped in our signature lavender and rosebud packaging. So whether it is a gift for you or someone else, the surprise you get when you open the box will make you smile!